Newspapers across the north of England have joined forces to call on Prime Minister Theresa May to "get a grip" after chaos on the rail network. Some 25 titles have called for an emergency summit in Downing Street to find a solution to the crisis. They said the recent chaos "made a mockery" of Government claims to be prioritising infrastructure in the cities of the north. The group also wants a review of rail franchising in the UK. 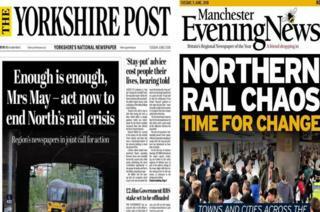 The Manchester Evening News, Liverpool Echo and Yorkshire Post were among the titles from three newspaper groups calling for action after passengers across the north were hit by crippling disruption following the introduction of a new rail timetable by train operator Northern. The group wants the trans-Pennine high-speed line prioritised over London's Crossrail II. Northern was also urged to clarify its plans for passenger compensation. The Northern Echo tweeted the call with the message: "We are on the side of rail passengers." The newspapers said Transport Secretary Chris Grayling should take accountability for the rail chaos and told Mrs May it was time to "get a grip". On Monday Mr Grayling announced there would be an inquiry into what went wrong. Passengers across the Northern network were hit by further delays and cancellations despite the company introducing an emergency timetable to combat disruption caused by the earlier changes to its services. Greater Manchester Mayor Andy Burnham tweeted that he is calling for a "wider ticket acceptance scheme" and suggested Transport for the North would issue a statement later today.